Are You Ready To Put Your Patio Furniture Away? The past couple of posts of ours have had a common theme; winter is coming! Many of the outdoor summer activities we enjoy are going to be on pause for the next few months, and many people will be putting things back into storage for the winter. Among the summer toys, one thing that many people will be starting to put away is patio furniture. As with most things, a little bit of love and care can go a long way in keeping your patio furniture protected during the winter months. Are you aware of some of the tips that can help keep your patio furniture look new even through the winter season? If you have metal patio furniture, give your furniture a good wipe down and check any rust. Should rust be found, you can use some steel wool to remove as much rust as possible, and apply an anti-oxidation primer and touch up paint to the area. Rust doesn’t just look bad; it can weaken the structural integrity of your furniture as well. For furniture that is made of cloth or rope (such as some hammocks) or has fabric cushions or sheets, a good wash will help prevent any mildew and mold from forming during the winter months. Make sure all of these are stored indoors during the winter. Plastic furniture often benefits from stronger cleaning agents. Find some gloves before using these cleaners, as some can cause irritation to the skin and eyes. A good scrub and rinse can have plastics looking like new in no time. Use a high pressure hose if possible to rinse. Wicker furniture also needs some love! A mildly abrasive sponge and detergent (water, detergent and bleach for example) can do wonders. After scrubbing, rinse well with a hose. While fabric and rope furniture should be stored indoors (preferably somewhere dry), metal, plastic and wicker furniture also benefits greatly from indoor storage. Metal furniture can oxidize much quicker in winter with constant layers of snow. Plastic furniture can handle the winter, but sun exposure will eventually cause fading which generally cannot be reversed. Store as much patio furniture indoors as you can. Metal and plastic furniture can handle the outdoors if absolutely needed. 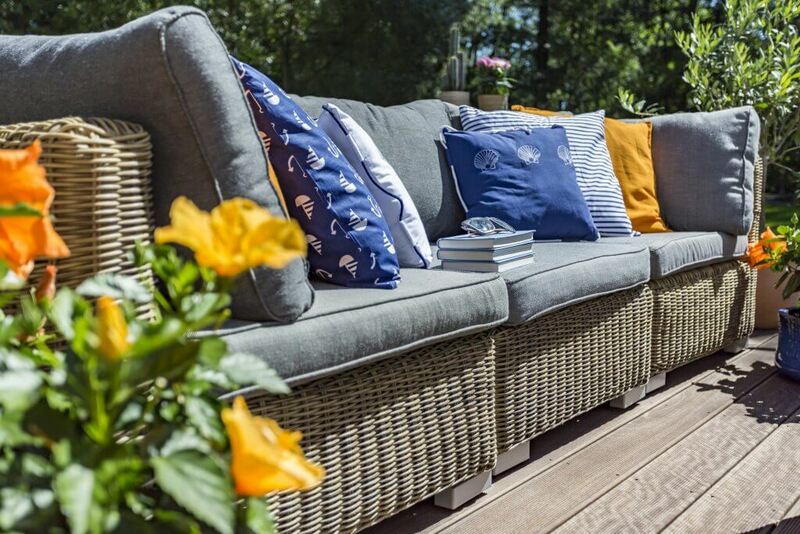 Following some of these tips can keep your patio furniture in healthy shape for next season. If you’re in need of some space to store your patio furniture don’t hesitate to take a look at our many different available unit sizes. We’re sure to have something that fits your needs and budget. Talk to us today to learn more!